Rice is one of the most important ingredients in the world. It is the basic food staple for many countries. 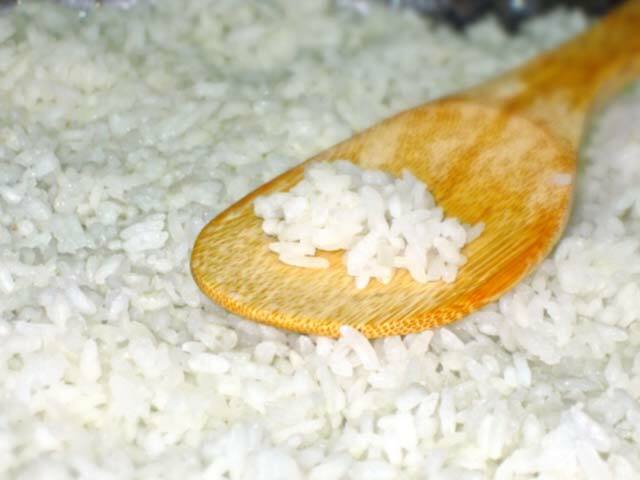 In Japan rice is not only a main dish, but it is also used to make rice vinegar, mirin, and sake. The Japanese have several words for rice. It is called okome when it is not cooked. Meshi, or Gohan is the name for rice when it is cooked or when it indicates that rice is the main ingredient of the dish. You can not have an authentic Japanese meal without rice, but most importantly you need rice in order to make Sushi Rolls for Sushi Friday. There is a special preparation that is required to get perfect Sushi Rice. The rice has to have a special texture and consistency so that it holds its shape when it is formed into Sushi rolls. You need to use Short Grain Rice, which is package as Sushi Rice in the supermarket. The package can say Calrose, Blue Rose, or Kokuho Rose which is a sushi rice variety from Northern California. Kokuho Rose is my favorite type of short grain rice, and the only one I use for Sushi. First of all place the rice in a large bowl. Rinse and scrub the rice with cold water until the water that runs off is crystal clear. It will take four to five washings to remove the cloudy water. This removes the powdered bran and talc that sushi rice is shipped with. Rinse all the water completely. Add the measured amount of 2 1/4 cups of water. Let the rice stand in the water for at least 30 minutes. After the water and sushi have rested, put the ingredients into a steel pot with a tight fitting lid preferably made of glass so you can see through. Turn on the heat to high until the water in the pot is boiling. When you see the bubbles forming in the water reduce the heat to the lowest setting and cook for 15 minutes. Turn off the heat. Let the rice stand for an additional 15 minutes. Place the rice on a wooden or glass container. Season with the Sushi Rice Seasoning. Be careful no to add too much seasoning or your rice will turn out gooey and very wet. Fan the rice to dry it out. Cover with a damp cloth. Combine all ingredients in a pan. Place it on low heat till all the ingredients are dissolved. Let it cool. Store in a container in the refrigerator. This recipe will work for several sushi rice preparations. Use 4 Tablespoons of sugar to substitute for Mirin. You can also buy ready made Sushi Rice seasoning.